[headline] => Will it be Nagarjuna or Chiranjeevi in Dhanush’s upcoming directorial? [description] => Dhanush’s first film as a director, Pa Paandi, was one of the biggest films in Tamil cinema in 2017 and the actor was much appreciated for his skills as a director. Actor-producer-director Dhanush K Raja will soon begin his second directorial which is being produced by Sri Thenandal Films. The story of the film is said to have Telugu based characters as well and hence there are speculations that a Telugu actor could probably be roped in for it. And after Dhanush recently met Nagarjuna during his visit, reports are doing rounds that Nagarjuna may be agree to do the role. And now, there are new reports doing rounds that Mega Star Chiranjeevi could be roped in for the characters in this Dhanush directorial. Latest reports reveal that Dhanush met Chiranjeevi when he was in Hyderabad and the mega star has agreed to do the bit in the film. And if this materialises, this will be one of the biggest films in Tamil cinema in the upcoming season. Dhanush’s first film as a director, 'Pa Paandi', was one of the biggest films in Tamil cinema in 2017 and the actor was much appreciated for his skills as a director. And expectations on his second directorial will definitely will be sky high and with an actor like Chiranjeevi coming on board, the hype around the film on another level. There were unconfirmed reports doing rounds a while ago that Dhanush met Nagarjuna in Hyderabad and discussed about this film, and soon something could shape up. "Nothing has been finalised yet! Dhanush was in Hyderabad recently and he met Nagarjuna. The duo had elaborate discussions where they discussed the possibility of teaming up. The Tamil actor was all praise for Nagarjuna’s acting in Oopiri, which had a wide release in Tamil too as 'Thozha'. The duo has decided on some basic plans and will figure out something concrete before meeting again," a source close to Nagarjuna had said. Either of these actors coming on board will be a huge thing for the film since both the actors enjoy a huge following in Tamil Nadu as well. Home » Tamil » News » Will it be Nagarjuna or Chiranjeevi in Dhanush’s upcoming directorial? 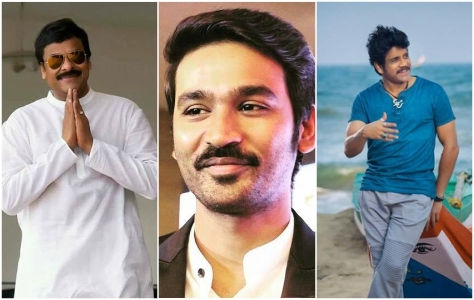 Will it be Nagarjuna or Chiranjeevi in Dhanush’s upcoming directorial? Dhanush’s first film as a director, Pa Paandi, was one of the biggest films in Tamil cinema in 2017 and the actor was much appreciated for his skills as a director. Actor-producer-director Dhanush K Raja will soon begin his second directorial which is being produced by Sri Thenandal Films. The story of the film is said to have Telugu based characters as well and hence there are speculations that a Telugu actor could probably be roped in for it. And after Dhanush recently met Nagarjuna during his visit, reports are doing rounds that Nagarjuna may be agree to do the role. And now, there are new reports doing rounds that Mega Star Chiranjeevi could be roped in for the characters in this Dhanush directorial. Latest reports reveal that Dhanush met Chiranjeevi when he was in Hyderabad and the mega star has agreed to do the bit in the film. And if this materialises, this will be one of the biggest films in Tamil cinema in the upcoming season. Dhanush’s first film as a director, ‘Pa Paandi‘, was one of the biggest films in Tamil cinema in 2017 and the actor was much appreciated for his skills as a director. And expectations on his second directorial will definitely will be sky high and with an actor like Chiranjeevi coming on board, the hype around the film on another level. There were unconfirmed reports doing rounds a while ago that Dhanush met Nagarjuna in Hyderabad and discussed about this film, and soon something could shape up. “Nothing has been finalised yet! Dhanush was in Hyderabad recently and he met Nagarjuna. The duo had elaborate discussions where they discussed the possibility of teaming up. The Tamil actor was all praise for Nagarjuna’s acting in Oopiri, which had a wide release in Tamil too as ‘Thozha’. The duo has decided on some basic plans and will figure out something concrete before meeting again,” a source close to Nagarjuna had said.